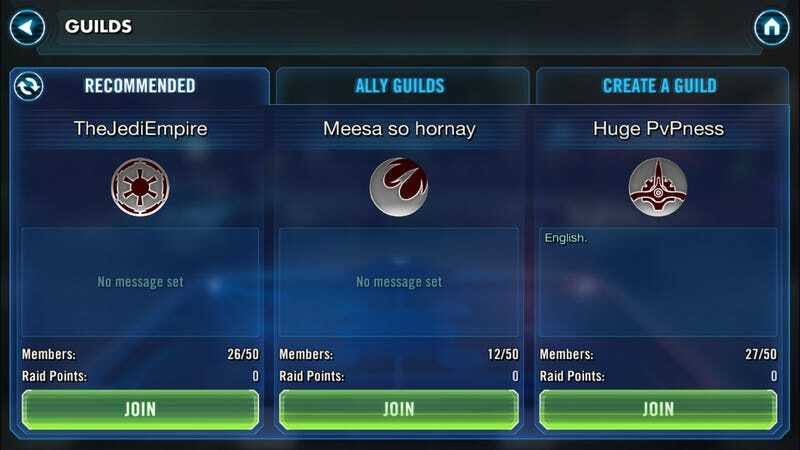 After spending several months sitting alone in the bathroom clicking Star Wars themed things on my phone, Galaxy of Heroes gives players the ability to sit together in the bathroom clicking Star Wars themed things, complete with horrible guild names. Three months after reporting playing EA’s free-to-play mobile Star Wars collectible RPG every day for three months my streak remains unbroken (though there were some very close calls). With today’s addition of guilds and guild raids, in which players form groups with horrible names and work together towards fabulous prizes, I’ll probably being doing this every day until I die. Guilds are unlocked when players reach level 22. To join a Guild, players can search for a friend, explore recommended Guilds, or create their own. New chat functionality lets players connect and strategize with Guild mates in real time. Guild activities provide ongoing challenges to inspire competition and cooperation with Guild mates for epic gear and rewards. A deep set of Guild management tools allow Guild leaders to customize a logo, make their Guild public or private, promote officers, manage membership, and more. Players can go deep into The Pit, the first in a series of multi-tier Raids that will grow over time. The Pit challenges Guilds to square off against a ferocious rancor, with multiple difficulty levels and a variety of rewards for players from levels 22 to 80. Raid leaderboards let players keep tabs on who’s ahead and who’s behind in the race to be the best and wealthiest in the Cantina. Don’t get enough recognition for your clever team names during trivia night at the local bar? Now’s your chance! C3P Bros is actually pretty clever. Upon careful consideration and upon realization that all the guilds with good names were full, I decided to go with the guild with the most wow. Now I’ll be able to coordinate my daily tapping with up to 50 people I’ve never met before, all in the name of a compulsion I’ve been trying to ignore for half a year but keep failing. I need to lose my iPhone. Star Wars: Galaxy of Heroes does have some fun in it, and if not it has collecting Star Wars people in it. Somewhere between those two I’m still enjoying myself. We’ll see how long that lasts now that I am part of a crack team of old meme dogs.